Learn basic shaping through 2 dishcloth patterns through step-by-step instruction and practice. Learn the basics of knitting through casting on, knit stitch, purl stitch and binding off. These skills will enable the knitter to make anything that will be square or rectangular. But the exciting part of knitting starts with shaping skills that will make other shapes and eventually garments possible. 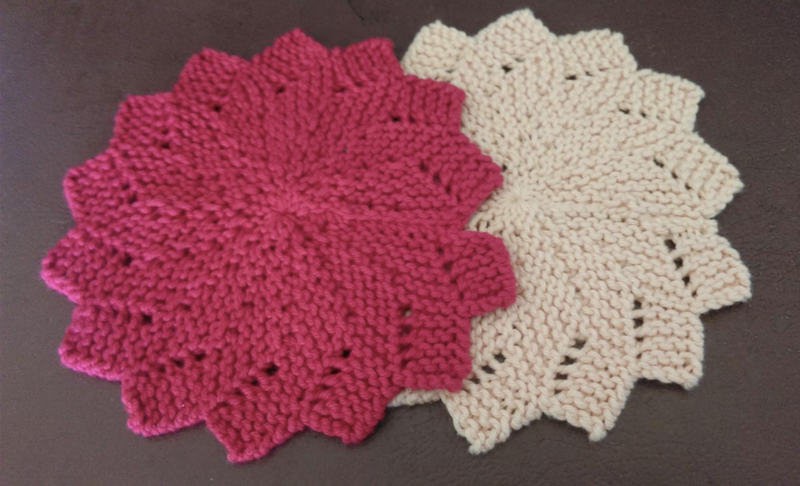 This class will explore increases, decreases and simple short-row techniques to make a bias-knit washcloth and then a pin-wheel shaped washcloth. This is a 4 part series taking place on Thursdays November 29th, and December 6th, December 13th, and December 20th. Plan to attend all four days. A ball of Peaches and Cream or similar quality/weight cotton yarn. These are available at Walmart, Joann's or Hobby Lobby. Participants should have completed Knitting for the Absolute Beginner OR be comfortable with casting-on, knit, purl and binding off. About the Instructor: Sara Jones is the Textile Lab Team Lead for Cruces Creatives. She has been knitting since 2001 and doing other fiber arts for more than 30 years.